There are a number of sponsorship options available down at L’ancresse, and we would be delighted to build a package to suit your individual requirements and budget. Sponsorship of a race is awarded to the winning owners of your chosen race in prize money and a trophy. As the race sponsor you will be invited to the parade ring before your race to enjoy the atmosphere, before returning to the winners enclosure where you will be asked to present prizes to the winning owners. We realise that a big part of race sponsorship is the opportunity to promote your brand and raise the profile of your business to a wide audience. We are committed to developing sponsorship and entertainment packages to achieve this whilst maximising your enjoyment of the event. The sponsored race will carry your chosen name, whether the name of your business or short advertising slogan (increasingly popular), which will be used in all media coverage including television and radio, broadcasts. The name will feature prominently in the race-card and space will also be provided for an advertisement or your business’ logo. We will reserve a space on the rails where your banner can be positioned or perhaps have your logo printed on a blanket for the winning horse in your sponsored race! Take advantage of our facilities to entertain your guests, with a food and beverage package, tailored by our on site caterers, to suit your requirements. You will be supplied with complimentary “sponsor” badges giving your guests access to all areas of the racecourse. Each guest will also receive a full colour race-card including tips and “how to’s” for the novice racegoer it contains all the information your guests will need to make the most of their day. Following your event, you will receive a photograph of your prize giving and an invitation to return as our guest at any of the meetings throughout the season. Basic cost of sponsoring a race is £2,500 per race, therefore please get in touch if you are interested. Sponsorship of the ‘Best Turned Out’ is also available for each of the five race’s. Give your guests the chance to play an active role in the day’s racing by judging the Best Turned Out horse in each race. Your hospitality requirements can be catered for as detailed above, your business name will be featured in the race card whilst additional advertising can be arranged to meet your requirements. Race Commentator Sponsorship: Mark Johnson will once again be commentating this year. The long time supporter of the Guernsey Race Club has visited many times and is always keen to come back. His busy schedule includes commentating across America and the UK. The regular presenter on Racing UK is one of Britain’s senior commentators, having called 5 Epsom Derby’s and 11 St. Ledgers. 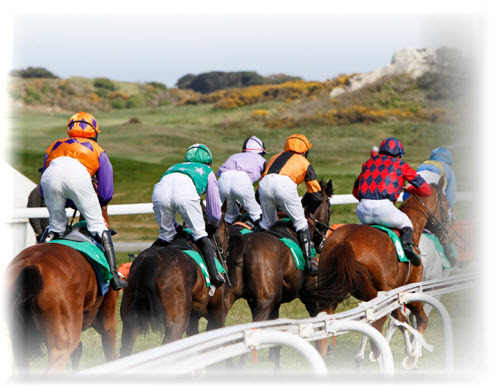 Ideal for a smaller organisation, your business name will be featured in the race card whilst additional advertising can be arranged to meet your requirements.